We are all packed and ready to leave in the next hour or so. I've made some portable grub for our long drive down south. 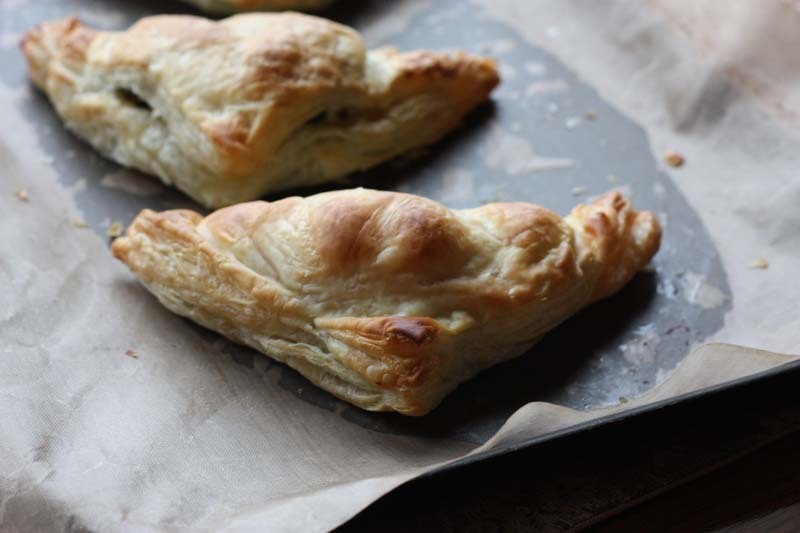 It may not be the tastiest of hand pies I've made, but it will certainly save us some pounds and pennies, after all we will have enough expenses with just petrol fuel. I call these hand pies, but really in the U.K we know them as pasties. Encased in this puff pastry is mashed up new potatoes with steamed curly kale and blue cheese: Stilton to be more precise. Again this is just a made up recipe to use up what we had in the fridge. 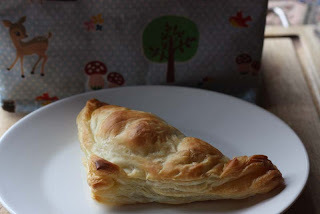 I made a couple extra which D ate and commented that they were like 'tangy potato pies and so much better than the veggie pasties you get from the High Street bakers'. Well of course, I thought - how on earth can you even compare them. Below - piping hot, straight from the oven. But for our journey they have been wrapped in foil and will be eaten cold at some point when we want to stretch our legs. I've also made a Winter Pasta Salad with the remaining curly kale, black olives and sun-dried tomatoes. 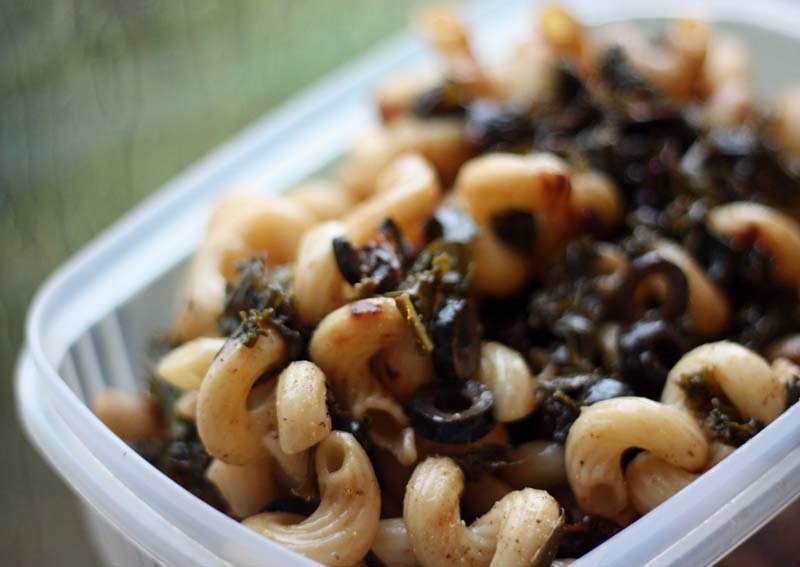 It's so dark and un-inviting that I think I am going to dub it 'Dirty Winter Pasta Salad'. And there are also a couple of slices of Cranberry Bread to enjoy with our flask of black coffee. Wish us a safe journey. See you in the New Year and of course how can I forget, Happy New Year to each and every one of You. Another take on mushrooms on toast. Yes its simply spiced up with tomatoes and makes for good hearty lunch, also a way to use up those tired looking mushrooms hiding at the bottom of the fridge. You can choose to eat this a number of ways with: naan bread, stuffed in pitta breads, even with rice - but an hour or so ago, we had it for brunch simply spooned over toasted slices of stale bread. Hey sometimes stale bread can benefit from being toasted. Some people would make croutons or even bread and butter pudding. I would too, but my husband is not keen on Bread and Butter Pudding. What he doesn't know though is I am planning to make some next year, if he won't eat it I know plenty of nephews and nieces who will lap it up. By the way this is my 1111th blog post. Wow I am pretty amazed with myself - its quite an achievement. I would do something celebratory about it, like a small give-away but this will have to wait until next year now, when I have moved and settled into my new abode. 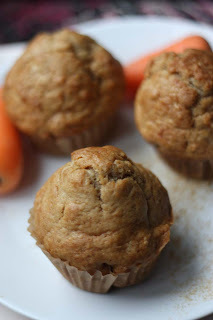 I am linking this recipe to Mom Trends for this weeks Friday Food and Recipe Linky. Heat the butter and oil in a wide pan over a medium heat under very soft, then add in the spices, garlic and ginger and cook for a couple of minutes for the spices to infuse the caramelised onions. Stir in the chopped tomatoes and cook on medium heat until it begins to thicken.. Stir from time to time to prevent the sauce from sticking to the pan. 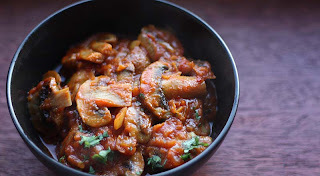 When the tomato sauce is quite thick, stir in the mushrooms and cook until your heart desires. I like my mushrooms to still have some bite, but I know some some like them cooked down a lot. When cooked to your satisfaction, taste and adjust seasoning if necessary, stir in the herb if using and serve immediately. We are due to be driving down South on New Years eve. This wasn't planned, but welcomed by both our families. Our first stop will be with my parents in Wales. Whilst there we will be checking out our new rental accommodation and signing the lease to move in etc. After that, it onwards to D's mothers, then back up to Scotland to make plans of our official home move. In an effort to use up fresh vegetables left over from Christmas (minus the sprouts) I decided to roast some root vegetables and garlic in cumin seeds. 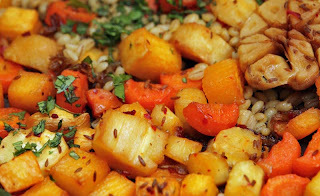 The combining of the root veg with the pearl barley was quite accidental, as my Basmati rice and Brown rice containers are bordering on empty. So it was between couscous, to which D wrinkled his face or pearl barley. which also didn't get a good reaction - but that wasn't to last as his first mouthful saw him give the thumbs up. Although he did add it was a tad dry, to which I responded by placing a tub of soured cream on the side. It was a good compliment to the roasted root veg. I actually felt positively healthy eating this, a good sign for post Christmas. If you have any left, it will be absolutely fine to eat at room temperature too. 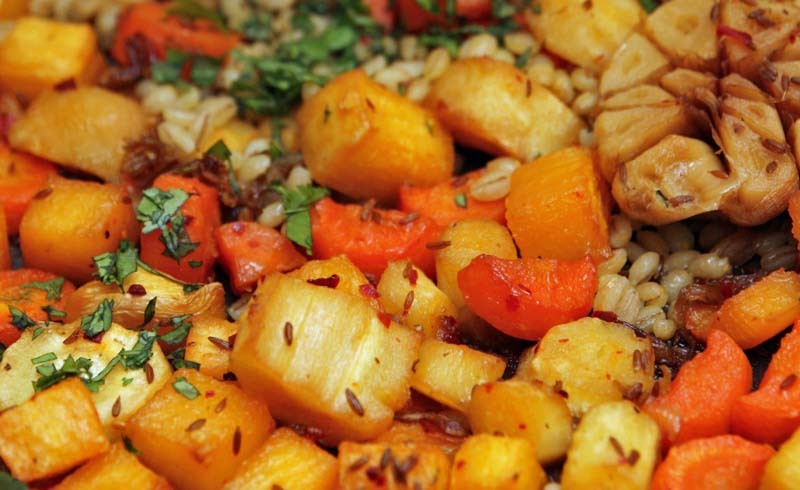 Just think of it as a Winter Root Veg Barley Salad. 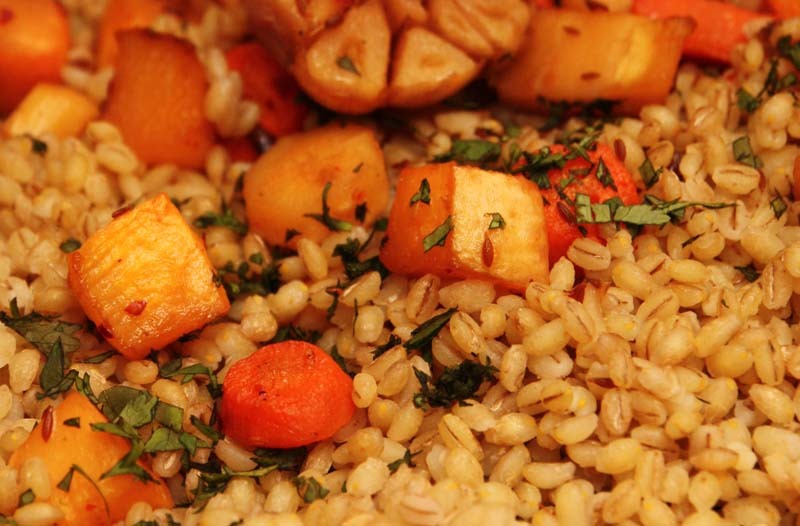 Cook the pearl barley in water according to packet instructions, when cooked, drain. Add salt and oil and combine. Set aside until required. Fresh coriander or parsley for garnishing. In a large bowl, combine all the vegetables and spices and then drizzle on the olive oil. Mix well, then tip onto a large tray and bake in the oven for 20 minutes for the vegetables to caramelise, stirring from time to time. After 20 minutes, pour in the vegetable stock, stir and return to the oven for 10-15 minutes until the stock has reduced. Remove from the oven and stir in the cooked pearl barley, return to the oven for a further 5 minutes. Then serve with a garnishing of freshly minced coriander or parsley. One of the imported ingredients I always buy around this time of year is cranberries. There is just something about these miniature edible cranberry baubles that sings festive holidays. Around this time of year, like many I like to experiment with cranberries and make muffins, biscuits and scones, however there was one cranberry pudding that always featured on my Christmas table: 'Cranberry, Orange and Almond Pudding'. Its really a warm and seasonal version of Bakewell Tart and we like it with thick custard - but sadly it was not made this year. 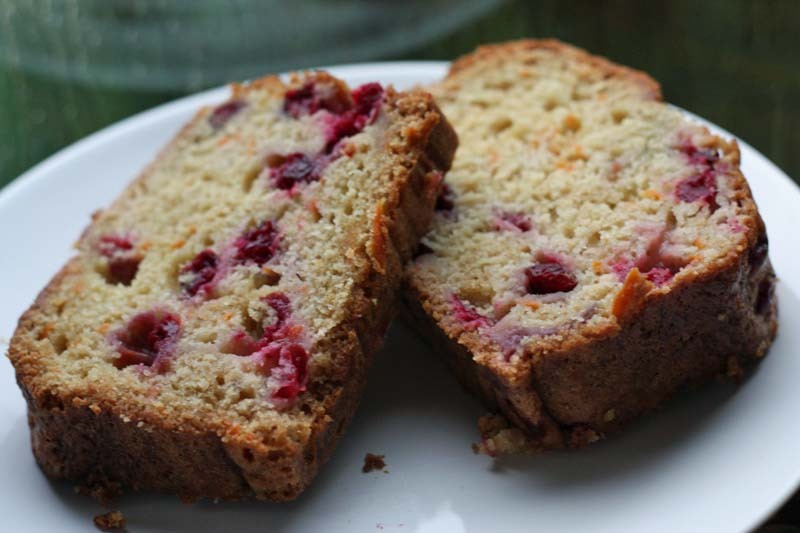 As there was only the two of at the table for Christmas dinner, I went for something that would keep and eat well over the week - Cranberry, Carrot and Orange Bread. Its good and after finishing writing up this post, I will be helping myself to a generous slice. I made a version of this Cranberry Bread a couple of years ago; and found it quite delightful. 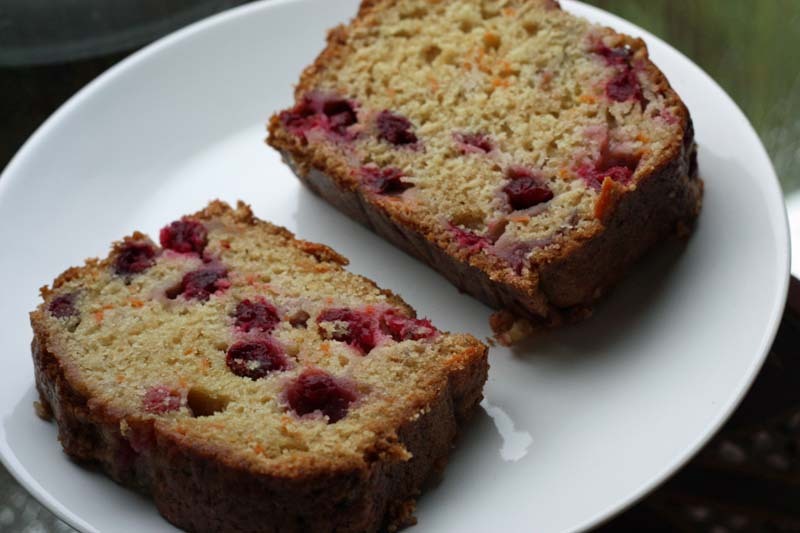 I like how the cranberries burst, piercing the loaf with their vibrant juices. 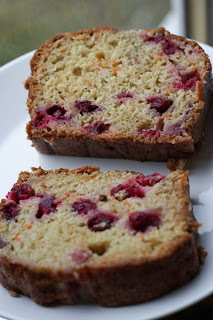 This bread is enhanced further with specks of carrot, which not only gives it colour, but sweetness next to the sharp tartness of cranberries. The orange juice is there, but ever so subtle. In a large bowl, combine the flour, sugar, baking powder, salt and soda. In another bowl, whisk the egg with the juice and then stir into dry ingredients just until blended. Stir in the cranberries and grated carrot until evenly distributed. Carefully spoon the batter into a greased 2lb loaf pan. Bake at Gas mark 4 for 50 minutes to an hour or until a toothpick inserted near the centre comes out clean. Cool in pan 10 minutes before removing to a wire rack to cool completely. 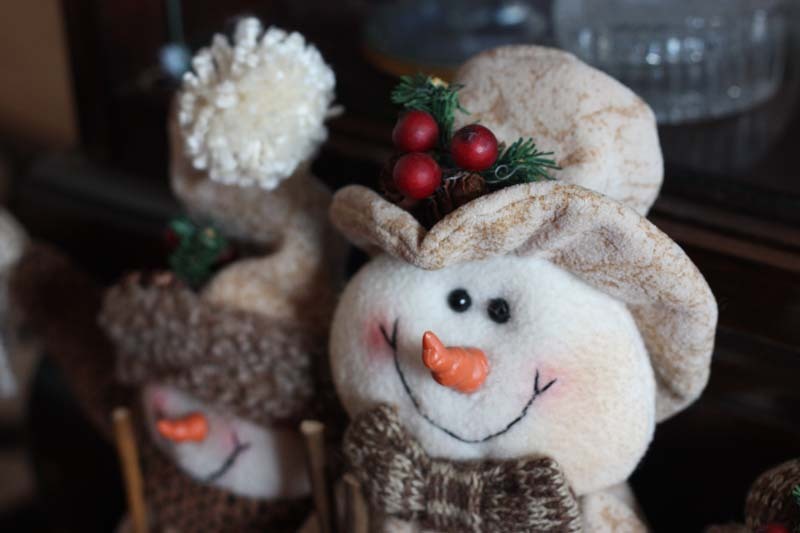 I would like to wish all my readers, A very Merry Christmas. Last weekend, we went into Glasgow city to inject a bit of Christmas cheer into our souls. There is presently a Christmas/continental market in the city centre. 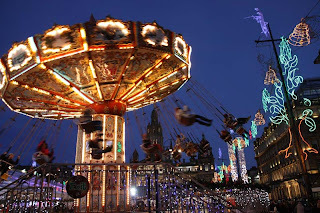 This time of year, I normally like to treat myself to a mug of mulled wine, but I was put off it a couple of years ago when I went to Edinburgh with my nephew - see here. The Glühwein we had from one of the stalls there was quite disappointing to drink like watered down blackcurrant juice. 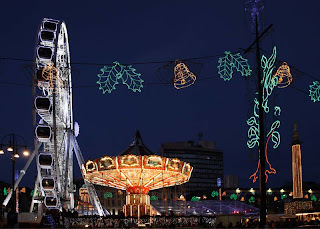 This is to say, it did not conjure up warm memories of drinking Glühwein in Gothenburg. 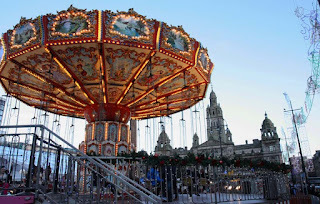 We continued to wander through the crowds, when I was tempted by the look of the churros. The smell evoked a memory of my time in the streets of Paris. There were even some aebleskiver - Danish pancakes for the offering, but the prices that were being charged to enjoy these deterred me. Instead the scrooge in me, found some pleasure in watching people being merry amidst the hustle and bustle. This carousel and the lights are namely in George Square against the backdrop of Glasgow City Chambers - a very impressive building - inside and out. This photograph (above) was going to be my entry to Tinned Tomatoes festive photographs, but somehow I missed the deadline. Boo hoo. So please, let me share some Christmas colour with you. Ah natural wintry dark day light is going to be around for a few months more, so moody lighting will have to be accepted by the amateur photographers and the food bloggers in us. 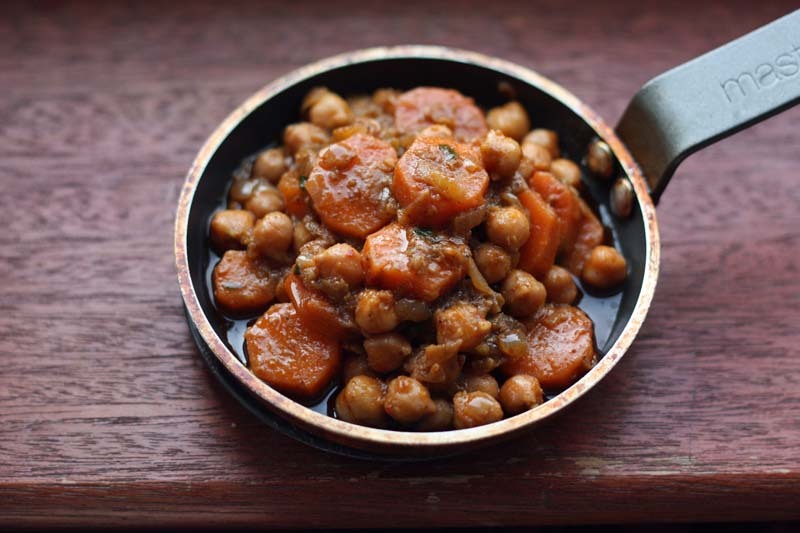 I made this 'Spicy Carrot with Chickpeas' last night for our evening meal. There was about a bowl left over (see below). I reheated it earlier and tipped it over some toasted bread. It was quite a nice change from plain buttery toast. I know know Hugh Fearnley-Whittingstall has a very similar recipe in his new book Veg Everyday, not that I have a copy (yet). I know this as I saw the recipe in The Guardian, or was it The Observer a few months ago. Anyway, in the mighty words of 'Mr Everything Comes From India', a character in the British sitcom comedy Goodness Gracious Me. I think Hugh and his team may have been inspired by some Indian home cooks when they came up with their variation. My version is by no ways authentic either. 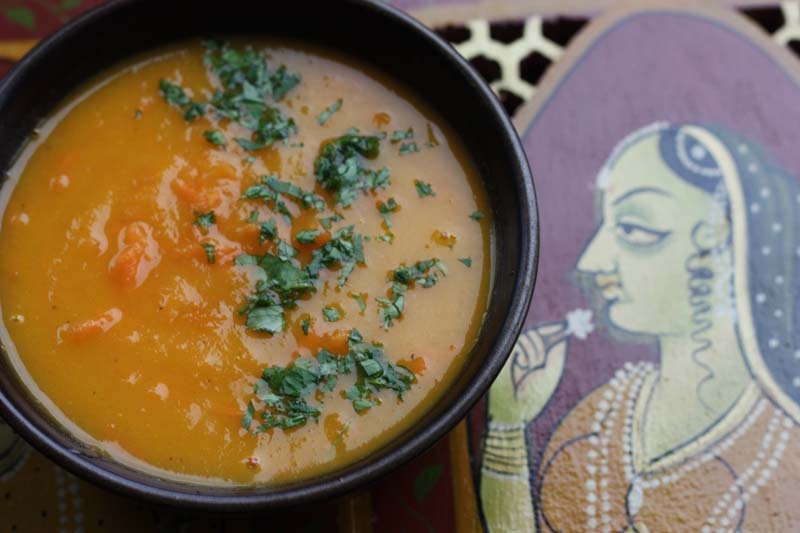 In fact my mother would tut and roll her eyes, as there is no onion or ginger in it for a start - a good base for any authentic South Asian 'curry', but it have flavours that are undeniably South Asian - warmth and spice! And its so easy to make that even the laziest of cooks will be satisfied with their homely attempts. I'd go as far as describing this as student grub - excellent for when your living on a budget. Oh how can I forget that's me these days - living on a tight budget and I am not even a student. Heat the butter and oil in a wide pan over a medium heat. Add the carrots, garlic and spices and saute them for 10 minutes or until tender, stirring often. Add a little water if its sticking to the pan. 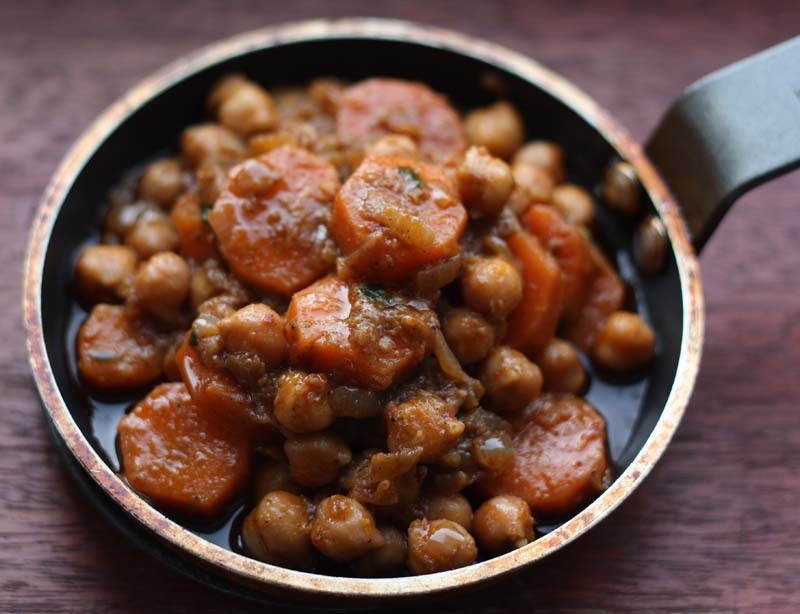 When the carrots are tender, add the chickpeas and cook until the chickpeas are warmed through. Serve immediately with chappati, naan bread, in pitta breads or even over toasted bread slices. I know I should be making some darling gingerbread people or star and Christmas tree-shaped gingerbread biscuits this time of year. The truth is making sweet biscuits aka cookies from scratch has never been my strong point. They always seem to lack bite and crunch. 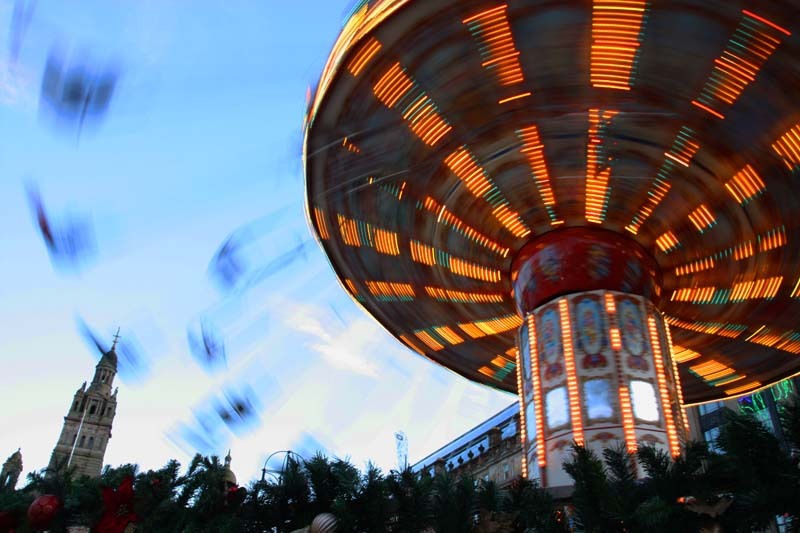 It is something I hope to remedy next year when I move closer to family with children and will have plenty of time to experiment on willing human guinea pigs. 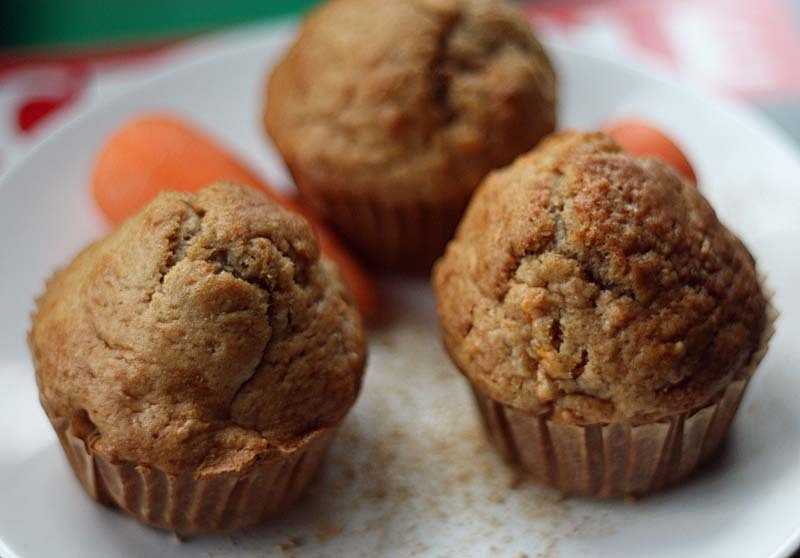 Anyway, all this is way of saying that I ended up making some Carrot Muffins with a fresh grating of ginger. You may think the fresh ginger would be overpowering, but actually its not. It just gives a fresh clean taste. I should also point out that these are not very sweet. These have just enough sweetness for what I think is a good breakfast cake! The only thing about them that made me raise my eyebrows, was its rather odd shape. Maybe I was a bit heavy-handed with the sifting of the flour, but upon baking they bloomed pointy upwards - looking more like acorns than chubby muffins. Still they were nice to eat with a mug of coffee. Sift the dry ingredients into a large bowl, then stir in the carrots and the wet ingredients. Stir gently until combined. Spoon into muffin cases and bake for 15 - 20 minutes or until a toothpick comes out clean. Adapted from The Garden of Vegan by Tanya Barnard and Sarah Kramer. The snow here has begun to melt away. I am glad of it, but I know some little kids down the road are wishing for a snowy Christmas. For them I hope a few snowflakes fall, but that's it. I don't want it to snow heavy, so that they can build snowmen, throw snowballs and go sledging. Yeah I must be getting old! Anyway, for those of you who have been reading my blog for a while, will know that I have a tendency to roll with an ingredient or vegetable. So please be forewarned the next few days will be filled with carroty goodness in various guises. Yesterday to get the ball rolling, it was a Carrot and Thyme Flan. Today its simply a soup. Carrot and Coriander to be more precise. 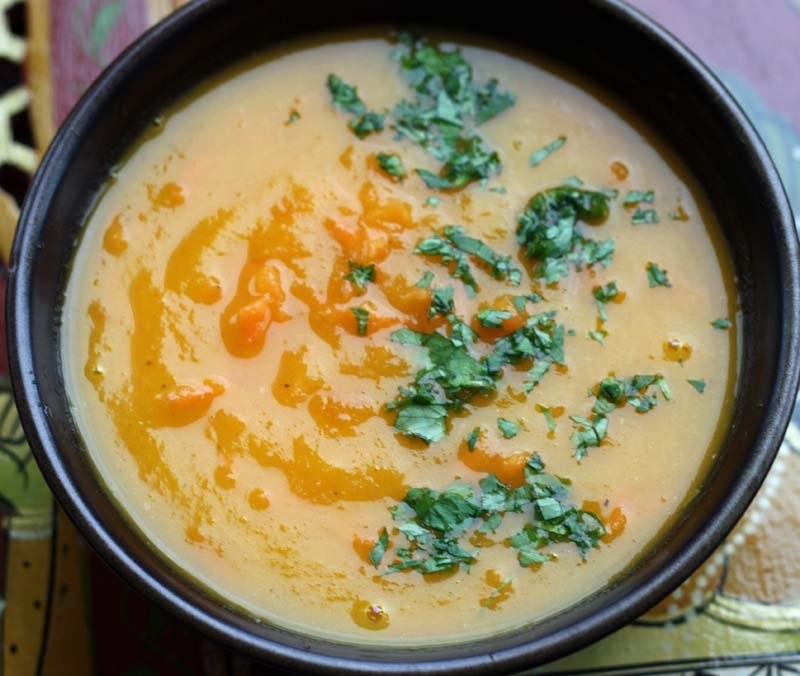 I know most people have there version of Carrot and Coriander soup, this is my take on a well spun recipe. You can blitz all the carrots if you wish, but I like to have a bit of texture, so tend to keep some back for bite. I hope you will enjoy this soup, but I would like to add that this carrot soup recipe is open to your interpretation. If you don't like the taste of coriander, you can stir in a different herb towards the end. Both parsley and thyme would work well. If you don't fancy fresh herbs full stop, perhaps a little bit of spice - ginger, nutmeg or maybe even a little cayenne. Go on, ring the changes and make this Your Carrot Soup. In a wide pan, heat the oil then stir in the onions and garlic, sauté until soft. Then add in the chopped carrots, the stock and simmer on medium heat until the carrots are really tender. Turn off the heat, when cool, purée in a food processor. Then return to the pot and stir in the grated carrots, fresh coriander and salt to taste, simmer for a few minutes before serving. It doesn't matter what the weather is like outside: autumnal or wintry, you can be rest assured that the one vegetable that will always inject some colour onto your plate is the orange root vegetable - the crunchy carrot. Another thing going for the carrot is you are able to find it all year round. Its also such a versatile vegetable, not only does it appear on your plate as a side dish, it can be transformed into a soup, a cake, a biscuit, a breakfast waffle, a dip or even a jam! A couple of years ago, I grew loads of carrots: in pots and in the ground. They tasted surprisingly like carrot. I know that's a odd statement to make, but once you've grown your own - you really do start tasting and smelling the difference in vegetables. Anyway, this time round - no home grown carrots for me, they had to be bought in. I was actually looking for some baby carrots for this recipe, but I couldn't find them so in its place I picked up some stumpy Chantenay carrots. If you can’t find either of them at your greengrocers or supermarket, just substitute them with the larger variety and chop it in half. I think carrots also lends itself well to many herbs, but in this flan they are infused with some homegrown (dried) thyme. I was encouraged by a blog post written by fellow blogger Nicisme at Cherrapeno to submit a recipe into a competition called a Carrot Competition. It is being hosted by lovethegarden.com. UPDATE; Fellow blogger RuckusButt of Food.Life.Dog. made her version of this flan. I think its looks splendid, please do go by and check it out here. Sift the flour with the salt into a large bowl. Rub in the butter until the mixture resembles coarse breadcrumbs. Add 2 - 3 tablespoons cold water to the mixture. Mix to a firm dough. Chill, wrapped for at least 30 minutes before using. Roll out the pastry and use to line a 8 - 9 inch round dish, then bake blind. Set aside to cool. In a medium pan, heat the oil and add in the shallots. Saute until soft without browning, then add the halved carrots, grated carrots, thyme and seasoning cook on low heat covered until the halved carrots are al dente. Turn off the heat. Taste and adjust seasoning if necessary. When cool, carefully remove the halved carrots with a slotted spoon and set aside. 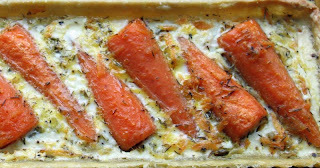 Gently spread the sautéed shallots, grated carrots evenly into the flan case. Then as you wish, decoratively lay the halved carrots on top. Whisk the milk with the egg. Pour into the flan case. Bake on gas mark 5 for 30 – 35 minutes until set. This is good at room temperature or cold. Edamame beans are often visually described as a cross between garden peas and broad beans. These legumes are actually young tender soy beans often imported from Japan and served as nibbles at Japanese restaurants. In the past couple of year, non GM soy beans grown in the U.K are beginning to appear at some supermarkets and greengrocers. However, those that are available fresh are often sold at a premium, either because the product is marketed as the new super food or a new celebrity diet food fad. Regardless, I was still curious to try soy beans, so I picked up a packet in the frozen food aisle at the supermarket. D looked at me and said 'you better make sure you use them all'. Well I am pleased to say that the packet is now officially empty. I've managed to make four different dishes from the packet: sesame soba noodles; yellow curry cabbage with mushrooms; vegan Vancouver Japadog-Style Hot Dogs (still to be typed up and posted); and finally these Spicy Edamame. 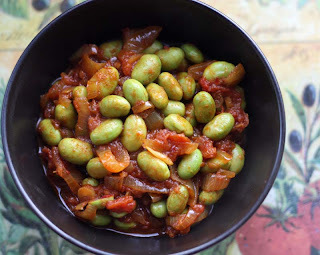 I bookmarked this recipe from Torwens blog last month for a couple of reasons, the first it was another recipe to use up the edamame beans in my freezer, secondly it looked quite good to me. He also showcased this dish as being healthy, something I am lazy at - so I thought why not give it a try?!. It was rather good, we had it for brunch this morning over toasted bread. These spicy edamame beans with tomatoes, gives 'beans on toast' a new meaning. Torwen calls his dish Curry Fried Edamame with Tomatoes. I've made some minor tweaks only because I had no spring onions in my fridge. Also the garam masala I have contains cumin and coriander seeds, so I omitted these from my recipe. As for the fresh tomatoes I used tinned tomatoes. Therefore, I think its somewhat poetic that I am sharing this dish with Jacqueline at Tinned Tomatoes who is hosting Decembers edition of Bookmarked Recipes: a monthly blog event initiated by Ruth of Ruth's Kitchen Experiments; as well as Kiran at Sumadhura who is hosting this months My Legume Love Affair #42, a popular bean-centric event created by Susan of The Well Seasoned Cook. Method Heat the olive oil in a wide pan and the shallots, sauté until tender. Then stir in the spices and ginger until fragrant. 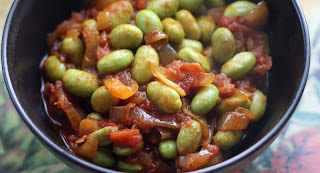 Add the tomatoes and cook on medium heat until thickened, then stir in the edamame beans to heat through and cook until tender. Serve immediately over rice or crusty or toasted bread. I know there are loads of 'Beetroot Hummus' recipes on blogosphere, but not one on my blog. So I thought it was time I introduced you to my version. 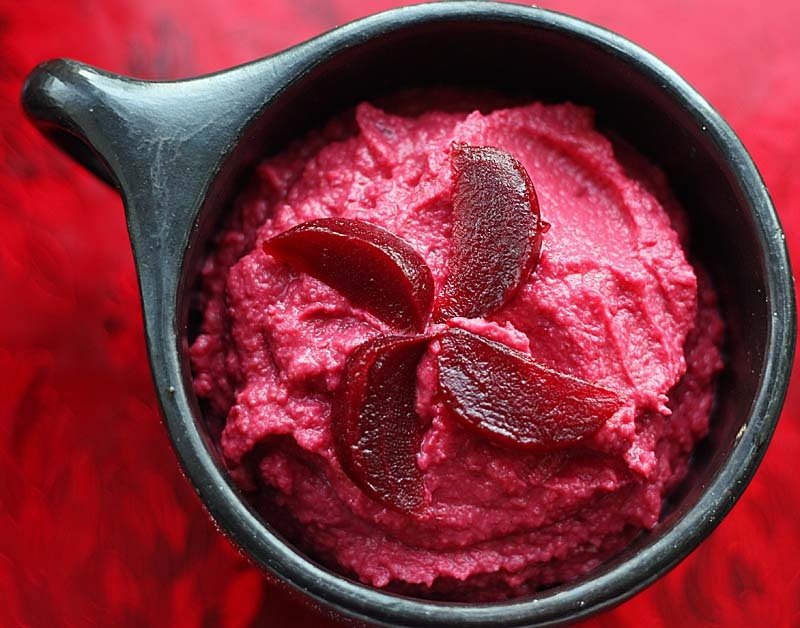 I can't actually call this 'Beetroot Hummus' because it does not contain the most essential ingredient: Tahini - a Middle Eastern sesame. Although my version lacks the nutty and bitterness you get from sesame paste. I think my version is still pretty good. Its sour and sweet - I can only describe its flavour a bit like plum sauce. Go on I encourage you to try it. If you don't fancy the beetroot, and I can understand that cooking a beetroot from scratch (boiling or roasting) can be a bit of a nuisance, and then peeling the skin and getting your fingers stained pink-red is not particularly appealing. But if you wish you can use pre-cooked beetroot. If this recipe still does not entice you, then you can if you want make the 'plain jane' version of 'Chickpeas Hummus', see here. It will still be good, but not alluring and tempting to the eyes as this deep crimson beauty. Sometimes change is good. 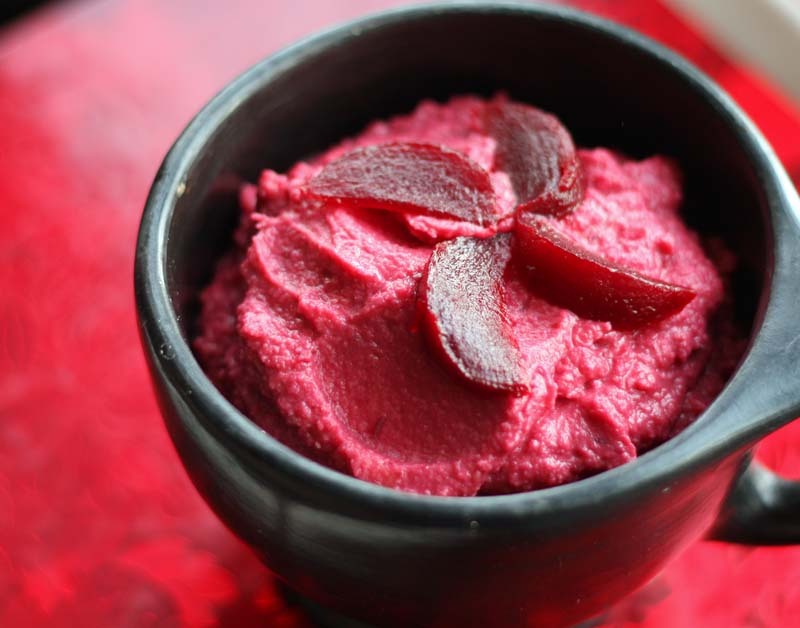 I am sharing this crimson dip with Ricki at Diet, Dessert, Dogs for her Wellness Weekend: 13-19th December . Whizz all the ingredients in a food processor until pureed. Serve immediately or chill for later, that is of course if you can wait! Remember those Almond Brownies I made last week, well yes they didn't even last the weekend. 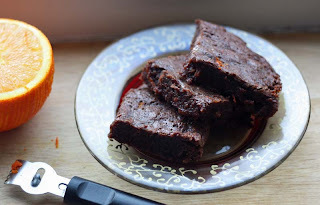 I made and photographed these Orange Jaffa Brownies early this afternoon. The flat still zinging with the scent of chocolate and fresh oranges. These Jaffa Brownies are very different from the Orange Brownies I made this time last year . 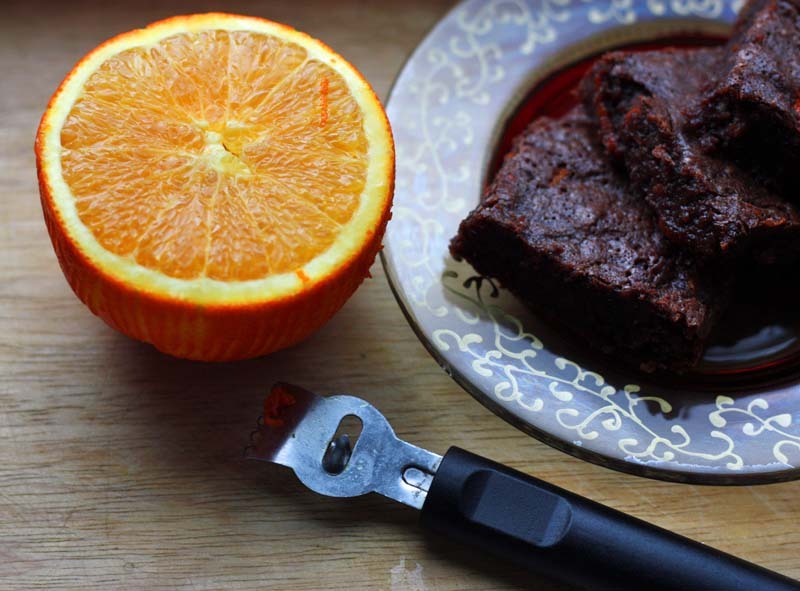 Those Orange Brownies were made with a orange flavoured chocolate. These however are made with a real juicy orange. 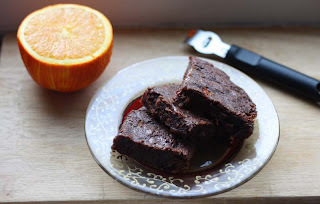 These Brownies are truly squidgy between the fingers and once in your mouth you will be greeted with a fresh citrus wake up punch (or kiss) from both the orange juice and zest. D said it tasted better than those foil wrapped chocolate orange segments that you see around the seasonal holidays. Anyway, all these rich chocolate treats are starting to show on my body - you know what they say 'a moment on the lips, a long time on the hips'... something like that. I swear I am going to start looking like a chocolate brownie and D: a white chocolate luscious Blondie! I am not kidding he has had three, yes three in one sitting. D is holding onto the brownie tin pretty tightly and is resenting that I am sharing some of these brownies at this months We Should Cocoa Challenge. Then it dawned on him that its being shared virtually in blogosphere!. Decembers theme is 'Oranges'. We Should Cocoa is alternately hosted by Choclette of Chocolate Log Blog and Chele of The Chocolate Teapot. Updated: January 2012: I absolutely love it when fellow bloggers cook or bake a recipe from my blog, there is something just so warming about it. Jo of Through the Keyhole made these Orange Brownies, check it out here, and so has fellow blogger The Cookie Jar - see them here. You will have to agree they look delicious! Makes 1 x 8 inch square tin, cut about 9, even more if you cut them into smaller bites! Line an 8 inch square tin with baking paper or grease well. Melt the chocolate, butter and sugar in a bain marie (or a bowl suspended over a pan of simmering water). Remove from the heat and allow to cool a little, then stir in the eggs, orange zest and juice until combined. Sift in the flour and fold in gently. Spread mixture into prepared pan and bake for 15-20 minutes or until top is firm to touch. Set aside to cool before slicing. I know purists will be throwing their arms in the air in disbelief, but hey if celebrity chefs can mess with traditional recipes, so can home cooks, even those who love their veggies. 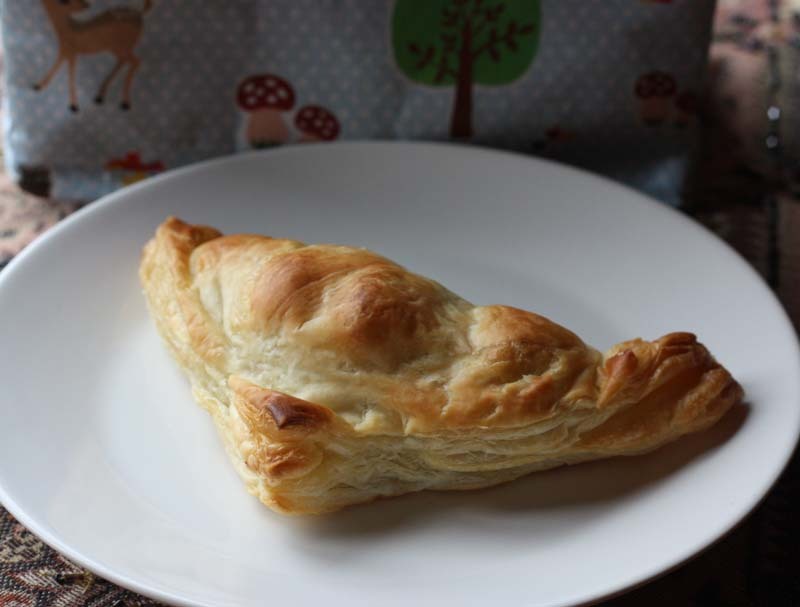 'Steak and Stilton Pie' is a meat pie. It can be found at many Blighty pubs who often offer it on their menu for evening suppers. It is often enjoyed with a pint of beer or a dark ale. Vegetarians have gone a step further, replacing the beef steak with mushrooms. 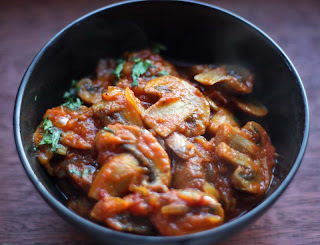 Why not - mushrooms are the natural meat of the vegetarian world. Its makes a fine vegetarian supper indeed. This afternoon though, I decided to take the vegetarian 'Mushroom Steak and Stilton Pie' another step forward, and make it with cauliflower steaks. A cauliflower steaks is simply a large cauliflower cut into thick slices, and cooked either in the oven; or a wide frying pan with little olive oil until cooked through and golden on both sides. You can also do this with Romenesco, yellow and purple cauliflower if your blessed to find them. I was introduced to Cauliflower Steaks about 3-4 years ago. It was then seen as a hearty vegan alternative to pan-fried meat. As you can see, its quite simple to make if you want to try. I''d encourage even those of you who like your meat to try it, you can still enjoy this it as a side veg. 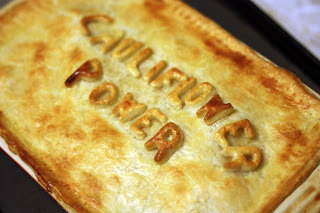 Anyway, the idea for this 'Cauliflower Steak and Stilton Pie' came to me yesterday after catching up with some of my blog reads. I was going to make a Cauliflower Soup with the second cauliflower that D picked up - actually it was going to be a twist on 'Broccoli and Stilton Soup', but then I changed my mind and decided to encase it in a shortcrust pastry. The result – good, very good - an excellent verdict from a person whose not that keen on cauliflower. You will have to forgive me for not showing you the Cauliflower Steak and Stilton filling. Lighting is so bad in the evenings, that even the shortcrust pastry pictures here are not that great. A shame really, as its made by my cold hands. I even played with my letter cookie cutter set with the remaining pastry trimmings. 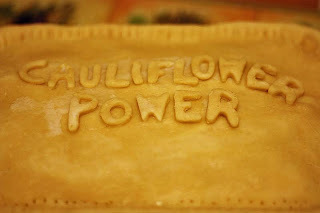 I think the last time I got to use the cookie cutter set was when I made a Cabbage Pie. I do hope you get the idea of what the filling is like: cauliflower dyed tomato red and funked up with stinky blue cheese. If you wish you can make this in advance and assemble it when you want to eat it. Then it can be served right from the oven to the table, hot with a golden crust - just like they do in the pubs! I've made one large pie here, but if you have individual pie dishes, then you can definitely make four of these. This will be our evening meal tomorrow too. In a large bowl combine the flour and butter until resembles breadcrumbs, then stir in the egg and enough milk to bind. Knead to form a dough. Wrap in cling film and chill for at least 30 minutes before using. 1 large cauliflower. To mimic steaks: slice the cauliflower from top to bottom into about 4 thick slices, then slice again once through the core, so that they are quartered. OR simply chop the cauliflower into bite-size florets, (please use the core too – it is very good). In a wide pan, heat the oil and sauté the onions until soft, then sir int the florets, tomato pure and stock. Bring to the boil, then reduce the heat and cook until the cauliflower is tender and the sauce has thickened. Season to taste. Pour the filling mixture into a pie dish, then scatter over the cheese evenly. Preheat the oven to gas mark 6. Roll out the pastry to cover the pie dish.. Trim the edges and cut a hole in the middle. Brush all over with the beaten egg. Bake in the oven for 25 – 30 minutes, or until crisp and golden. Serve with mashed potatoes and green peas. Do You Like Your Neigbours?